How does a Christian faithfully engage a biblical worldview in a culture of ever-evolving sexuality? In Love Thy Body: Answering Hard Questions About Life and Sexuality, Nancy R. Pearcey presents a clear and compelling book that helps bring the light of biblical truth into the darkness of our own cultural assumptions and understandings. Pearcey begins the book by laying the logical foundation for Christian worldview that she has so clearly written about in her previous writings. At it’s core, the culture has chosen to divorce values from facts and to place them into two different logical categories. In doing this, truth and logic will always be trumped by feelings and personal preferences. This leads to a world where right and wrong are replaced by the idea of personal choice and decision as the basis of morality. Into this culture, Pearcey speaks to the current day cultural struggles regarding the hot topics of abortion, euthanasia, sexuality, homosexuality, transgenderism, and the reframing of the family. These are all topics that are allowed to culturally exist and evolve due to the choice of personal preference over logical fact. Love Thy Body is a compelling call for Christians to engage the culture around them, to call people to a Christian worldview, which is in so many ways more desirable and compelling than the cultural narrative, and to challenge them to stand for truth even though truth with challenge many people’s personal preferences. 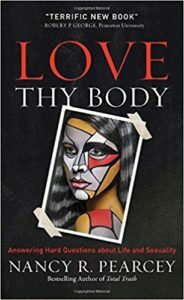 Like all of Pearcey’s work, Love Thy Body is a well-written, thoughtful, and compelling resource that all readers wanting to dig deeper into the Christian worldview and secular culture should engage.